Lesley & Callum - 24 June 2017 - The Lodge, Bowcombe Estate, Shorwell. I had the pleasure of creating the bouquets and buttonholes for the wedding of Isle of Wight Bride & Groom, Lesley and Callum. Lesley had an Alice in Wonderland themed wedding so her bouquet was made to tie in with the theme. I added cute pieces such as "eat me" cookies, a teapot, flamingo and hanging from the underside was a pocket watch. There is so much to see in her bouquet. Her bridesmaids wore wearing candy pink coloured dresses and their bouquets were made using paper flowers along with matching candy pink button centres. Matching buttonholes were also made for the Groom and wedding party all keeping in the same colours. I even made buttonholes for Lesley's two cute dogs! And don't you just love Lesley's Irregular Choice shoes!!! In June 2016 I had the pleasure of creating the bouquets, buttonholes and button wand for the wedding of Ruth and Thomas. Ruth is sister to Liam Payne of One Direction fame so you can imagine how excited I was to work with her. Ruth said her theme was daisies and butterflies and I had free reign with designing her bouquet. Royal Blue was the main colour and Ruth's dress was ivory so I combined these colours along with a little yellow which I added to the paper daisies which made up her bridesmaids bouquets and also the buttonholes. Here are some photos of her day and of the bouquet I created for her. You can read more about it over in the "Press" section. Nicola first got in touch via email as she was interested in having a button bouquet for her wedding. The National Wedding Show at Olympia was fast approaching, (where I had a stand) and I asked if Nicola and Daryl would like to come along and see my work first hand (as when you exhibit at the NWS, you receive a few free tickets). They travelled all the way from Leicester to London to come and see my work and to have a great day out at the Show. 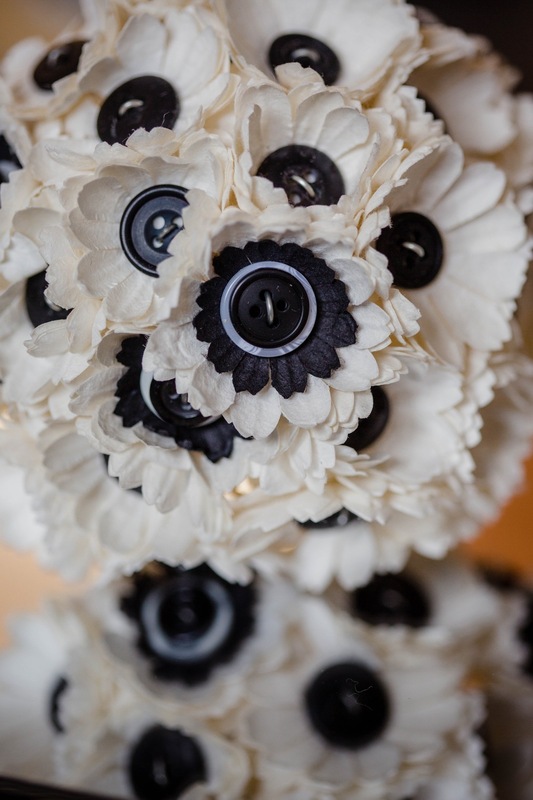 For Nicola's wedding (which was in February 2016), Nicola asked for a simple, no fuss button bouquet using plain buttons in a mix of black/white and grey/silver. 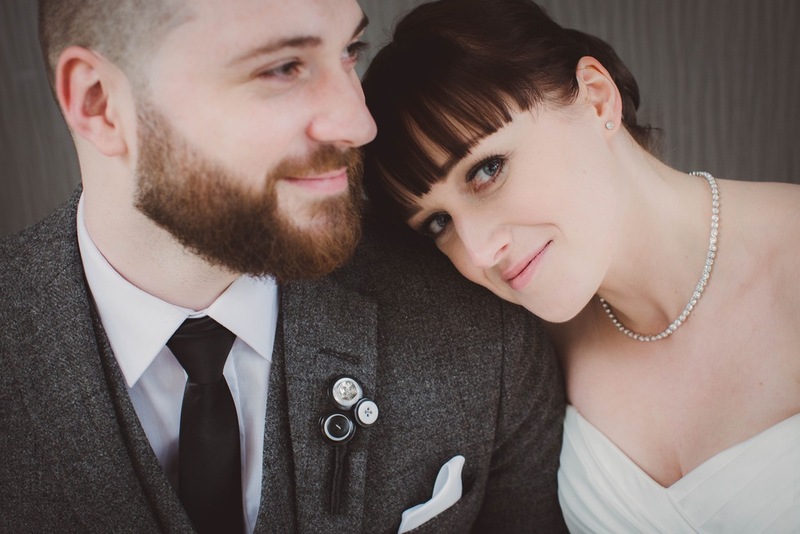 Daryl had a matching buttonhole made from all buttons, to tie in with Nicola's bouquet. Her bridesmaids had matching paper flower bouquets and the groomsmen also had paper flower buttonholes. "Just to let you know, we've received the bouquets! They are AMAZING! I can't wait to show them off to everyone on the day! (They are a massive secret at the moment) they are such good quality and better than I could have ever imagined! This children's buttonhole is just perfect for a Halloween / October Wedding. I have been wanting to try this out for a while now and have finally gotten round to creating it. Imagine, when the lights go down and it is time to party - just flick that switch and the ghost lights up and flashes in different colours. It is bound to be a talking point and bring lots of smiles to the children's faces. The buttonhole design has a large orange sparkly glitter leaf and a faux black leather leaf in front. It is attached by a secure brooch fastening on the reverse and will arrive in its own gift box for safe-keeping. This buttonhole can be personalised by changing the button text from a selection available when you purchase. Beautiful Brooch bouquets!! We are pleased to announce we are taking orders for full brooch bouquets. We can use new brooches and vintage brooches. 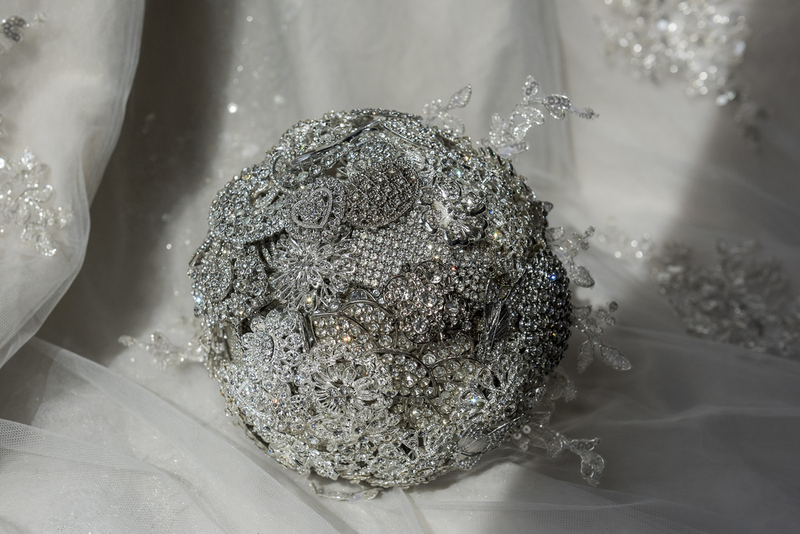 If you have any sentimental brooches you would like incorporated you are more than welcome to send them to us for inclusion.This gorgeous brooch bouquet was our first and made for my gorgeous bride Fallon. Fallon sent me offcuts from her wedding dress which I made into ribbon and used on the stem. She also sent me the appliques from the offcuts which I made into leaves for the collar of the bouquet. It was a ball of sparkles and received a lot of attention in the boutique when I was making it. Fallon also had one of our solid silver date tags attached to the underside of the bouquet which read 10/4/16. 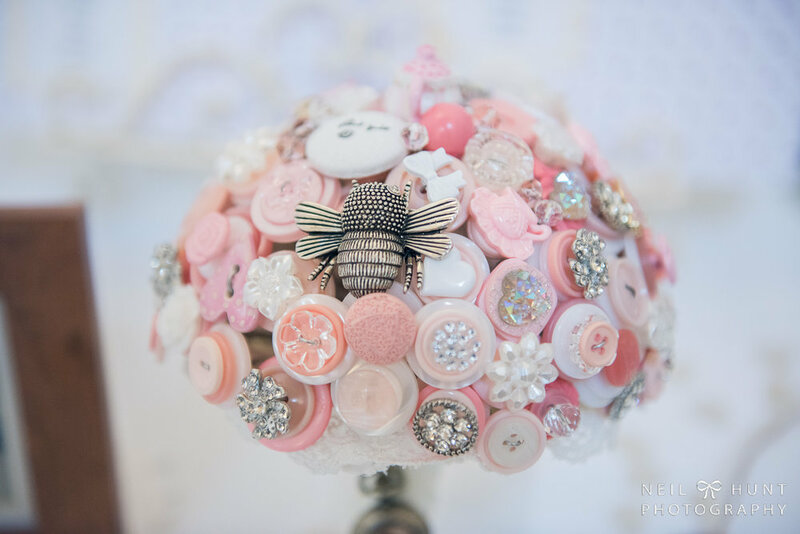 Ideas on how to personalise your button bouquet created by I Heart Buttons.